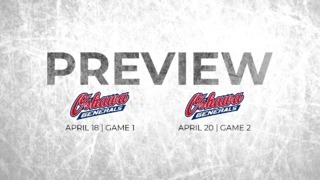 The OHL regular season is finally upon us and Ottawa 67’s hockey is back! The 67’s open their regular calendar on Friday night as they host the Mississauga Steelheads in to kick off the 2018-2019 campaign. Less than 48 hours later, the Barber Poles will face the Peterborough Petes in at 2 p.m. at the Arena at TD Place. You can get your tickets by clicking here. 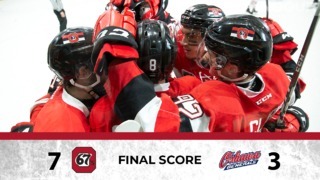 The Ottawa 67’s come into this season with an exciting mix of veteran talent and young skill on a team that was just ranked #10th in pre-season CHL rankings. Nine players from the 67’s were at or remain at NHL camps, underscoring the weapons Head Coach André Tourginy will have at his disposal. The return of veterans such as Sasha Chmelevski (who remains away at San Jose’s training camp, Kody Clark, Tye Felhaber, Mitchell Hoelscher, Kevin Bahl, Noel Hoefenmayer and others will be joined by touted rookies including Marco Rossi, Cameron Tolnai and Jack Quinn for what is expected to be a fast, exciting team. The Barber Poles will look to get off to a solid start to their season with two home games against Eastern Conference rivals Mississauga and Peterborough. Last year, Ottawa had a record of 2-2 against Mississauga and 5-2 against their division rival Peterborough. The Steelheads are coming off a 33-32-1-2 season, where they racked up a total of 69 points in the standings, tied with the 67’s. Counting on the presence of their star players Nicolas Hague and Owen Tippett last year, Mississauga will have a relatively new look as both are more than likely making the jump to pro hockey this year. The Steelheads will be led by fourth-year player Ryan McLeod, who will be turning 19 Friday. McLeod is an Edmonton Oilers 2nd round pick (40th overall) in the most recent NHL Entry Draft held in June. He finished third on the team in scoring last season with 70 points. Goaltender Connor Ingham, who was picked in the 6th round by the LA Kings this past summer, will present a tough test for the Barber Poles. After being eliminated in 6 games during the first round of the playoffs by the Barrie Colts, Mississauga will be looking to start the season on the right foot with a win on opening night. The 67’s seemed to have the Petes’ number last year, as they won five out of the seven contests between the teams that season. Peterborough finished last year with 52 points in the standings, which was short of a playoff spot. The Petes will be looking to bounce back this year, and they have the pieces to do so. Peterborough counts on seven players that have been drafted in the NHL, the Petes are optimistic about this year’s group. Zach Gallant, Christopher Paquette, Semyon Der-Arguchintsev and Cole Fraser, Austin Osmanski and Declan Chisholm will be the veteran names that Peterborough will turn to this year in order to bounce back. Another player who will be interesting to watch is Peterborough’s 9th overall pick in the most recent CHL Import Draft, Liam Kirk. Kirk was picked in the 7th round by the Arizona Coyotes as the first ever England-born and raised player to be drafted by an NHL team. Marco Rossi showed what he was made of during pre-season, as the rookie Austrian forward finished the exhibition calendar with 2 goals and 2 assists for 4 points in as many games played. Kody Clark recently appeared in two pre-season games for the Washington Capitals, who picked him in the 2nd round (47th overall) in the most recent NHL Entry Draft. Graeme Clarke and Head Coach André Tourigny will be appearing in their first competitive hockey game since the month of August, where they won gold with Team Canada at the Hlinka Gretzky Cup. Clarke finished the tournament with 2 goals and 1 assist for 3 points in 5 games. 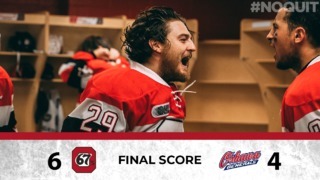 67’s forward Austen Keating is only 3 points away from 150 points as an Ottawa 67. For these two games, Ottawa will be counting on the services of 7 players who have recently arrived from NHL training camps: Noel Hoefenmayer, Kevin Bahl, Kody Clark, Merrick Rippon, Mitchell Hoelscher, Hudson Wilson and Sam Bitten. Friday’s opener marks the first Friday Night Live! of the season featuring a party zone in the general admission section, $7 Bud/Bud Light until the end of the first period, ticket and a beer for $20). The game against Peterborough falls on Family Sunday Funday (ticket, pop and hotdog for $25, kid zone, post-game skate).